When I went into We. The Revolution, I was expecting something different. I was expecting something more strategy-based, so I was surprised when I got into it and found a courtroom game similar to Danganronpa or Ace Attorney. That being said, it wasn’t exactly an unpleasant surprise, as I jumped into this courtroom sim set at the height of the French Revolution. Something interesting about We. The Revolution is that there are no correct answers for any of the case; everything is deliberately designed to be fully unclear whether the defendant is guilty or innocent, leaving the verdict fully up to you as the judge. There’s a number of different directions you can take with your decision; pursuing your idea of justice, holding people to the letter of the law, pursuing your own agenda, or any other motivation you might come up with. Different decisions will have different impacts on your standing with the different factions in the revolution, which can lead the story along different paths to different endings. The court cases are incredibly stressful, forcing you to try and find connections between different elements of the case to work your way towards a verdict. Hearing different pieces of testimony will sway the jury’s opinion of the case, which you can either use to try and make the best decision or you can try and manipulate them into staying with you when you make your own decision. Keeping the jury with you affects your influence stat, which you can then use in between trials to move your team members around Paris. The team members have different effects, such as increasing your standing with factions, taking out enemy agents, or others. There will also be random events that come up in the world during trials, which you can choose to investigate or ignore, also influencing the path of the story. The visual design in We. 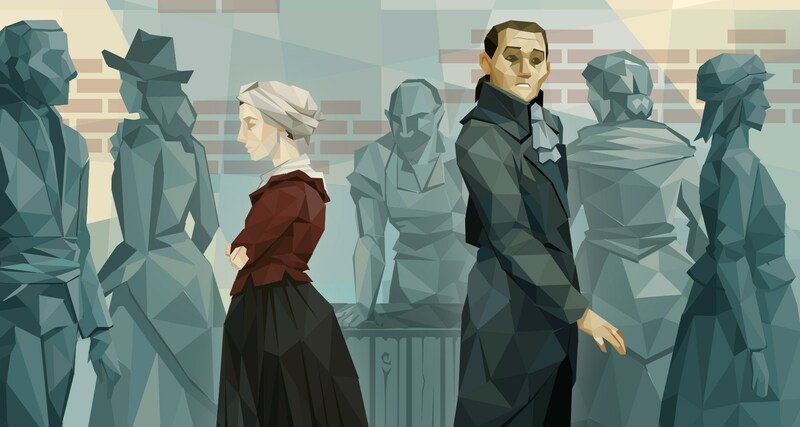 The Revolution is great, with everything having a faceted, polygonal look. The style is unique and distinctive, and looks great in motion in the game itself, giving it a colorful, almost painterly style that complements the period and setting. I’m looking forward to getting to play more of We. The Revolution, seeing more of the cases, and seeing how the story changes with different decisions. There’s a lot of depth to the trials, and especially since there’s no set correct answer it’s extremely difficult to know what the correct decision might be. It requires a lot of forethought to make sure you lead your story and alliances in the correct direction, making sure you don’t walk yourself into a corner along the way. If you’re into this type of game, I would strongly recommend you check it out, as I will be, when it releases on Steam near the end of the year.